Doesn’t matter if you are diving to Ladakh or catching a flight, Leh is the point where you’ll arrive in order to start your journey in Ladakh. Yes, you can come via Srinagar and stop at Lamayuru but then again, it will only be a break for your inevitable arrival in Leh. Most of the Ladakh itineraries tell you about the best places to visit in Ladakh and show you photos of Pangong Lake and Nubra Valley. Despite being a place from where they start and end their journey in Ladakh, it is often ignored by the tourists. Leh has a lot to explore and when it comes to food, it has some of the best restaurants in Ladakh. From quaint cafes to cozy restaurants with great views, you’ll find everything. Leh City is dotted with amazing cafes, restaurants and cheap eateries for travellers from every walk of life. During my one month spent in Leh Ladakh, I got a chance to explore a majority of these places. Here, I am listing down some of the best places to eat when you are in Leh City. Adjacent to Leh Market, you’ll find a tiny lane connecting to Chubi. This short cut will take you to the back alley of Leh Palace. Kashmiri Gali is not a restaurant but a small settlement of people coming here from Kashmir who have set their business here. This gali is famous for a couple of small cafes with cheap food. But it is the Kashmiri Bread and Mutton Samsa (Kashmiri version of Samosa) that are most famous. A piece of Samsa is only INR 12 and is extremely delicious. Probably my most favourite café in Leh, World Garden is present near Chagspa and the setting is to die for. Seating is available amidst a beautiful garden and they have a nice menu. Those who want to enjoy Vegan food in Leh will not be disappointed with World Garden Café. By far, my most favourite place in Leh, Open Hand is located on Fort Road. This establishment has its branch in Varanasi and has done a lot to support local artists and artisans. Open hand café has a nice selection of Pasta, Brownies and coffee. The outer setting is perfect to enjoy views of the mountains. If you are looking for some light energetic meals during your time in Leh then Ladakh fine food will be perfect for you. Enjoy some Seabuckthorn juice and see your energy coming back in moments. Leh Ling is not hard to miss. Located near Leh Post office, it is one of the best places to eat in a budget during your time in Leh. A plate of maggi is only INR 50 and they have nice selection of coffee and coolers. Leh Ling’s ambience is perfect for a book lover with a huge selection kept separately for books and souvenirs. The market near Polo Ground is the best place for the visitors who want to enjoy local Ladakhi food. Most of these small stalls serve local bread with omelette and tea. You can also ask for Butter Tea as most of them have it in the morning. A nice place for those travelling to Leh on a budget, Madras Café is the only place to enjoy South Indian food in Ladakh. They have an authentic selection of Vadas, Dosa and Idly. It is located on Fort Road and not that hard to spot. One of the fancier cafés in Leh, Namza has a unique selection of fusion meals, cakes and coffee. The budget is on a higher side but the view from the café is to die for. If you just want to enjoy the view and setting then order a Caramel Custard and Americano. If you are looking for something authentic then order Yarkhandi Pulao. On a side note, the staff is kinda rude to the budget travellers. 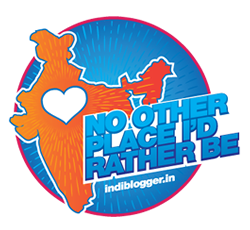 May be they know that people like us are only there for blogs and click photos :P.
Budget travellers going to Leh Ladakh will like Paratha very much. One of best places to have cheap meals in Leh City, Paratha keeps you close to your North Indian food. They have more than 20 varieties that is served with pickles, eggs and curd. Their tea is really heavenly. Paratha is located in German Bakery complex. Now for the ones who love Non Vegetarian food, Leh has the perfect place where you should go to enjoy it. It is not a restaurant but street food joints present in Leh Market. These small establishments come alive in the evening and run out of stock in two or three hours. A plate of chicken seek kebab is only INR 30 and is served with a piece of rumali roti. Isn’t that yumm? This community kitchen is organized by the women’s association of Ladakh. This place is perfect for those who are looking for places to eat authentic food in Leh. Most of the selection are available on very nominal rates. These small stalls belong to individual villages around Leh and the food is prepared on the spot. It is not necessary for everyone to plan their trip to Ladakh and Kashmir together. That doesn’t mean that you will have to keep yourself devoid of Kashmiri food. And while there are many restaurants for the same, no one is better than Budshah. Fun fact, the name was supposed to be Badshah but there was a typo and they ended up naming if Badshah. Enjoy plates of Mutton Rogan Josh, Rista and kebabs and you’ll love everything. If you are looking for Samosa with choley or chana bhatura, then this is a perfect place for you. Best place to enjoy aalu paratha, maagi along with tea. A meal costs around 60 to 80 bucks. German bakery has its own status in Leh. It is located in the same complex as paratha. Don’t go here in night because the leftover food gets stale and kind of hard to eat. A small joint in Leh market, it is kind of hard to locate but is perfect for those looking for cheap eats in Leh. They have a unique menu everyday where they serve something authentic from Ladakh region. Located in the market area, you’ll find the best Gulab Jamun in Leh City. Enjoyed reading all your food haunts. The Kashmiri Gali sounds interesting, and those mutton samosas must be divine! I also like that you have mentioned vegan options. These do look like some tasty restaurants to try. If I’m ever in this area, I’ll be sure to pop in. I love to eat! It looks like there is a lot of amazing food and really great restaurants. This would be really great to know about when traveling to the area for sure. This food all look soooooo good! Would love me some of it now! Home cooked foods are always good. There’s a lot of canteens in the Philippines, too. Those foods look so delicious! When I went to Rome, I found that our favorite places were ones often ignored by tourists. That’s why I like to look for places like Leh when I’m on my trips. I do adore food and love to discover new food places! all the food looks fantastic! It’s very cool to read about all of the different places to eat here. And the fact that you showed a lot of places that were affordable too — that makes me happy! And…you showed me several types of samosas …yum! Pretty cool to see this place through pictures! Thank you for sharing! These are really good collection of restaurants. I like the places and environment at large. I’d love to be at Polo ground market! I mean, I wouldn’t miss a good cup of tea…especially with an omelette!